For the electoral districts named for this city, see Lloydminster (electoral district) and Lloydminster (Alberta electoral district). Nickname(s): "Border City" or "Canada's Border City", "Heavy Oil Capital of Canada"
Intended to be an exclusively British Utopian settlement centred on the idea of sobriety, the town was founded in 1903 by the Barr Colonists, who came directly from the United Kingdom. At a time when the area was still part of the North-West Territories, the town was located astride the Fourth Meridian of the Dominion Land Survey. This meridian was intended to coincide with 110° west longitude, although the imperfect surveying methods of the time led to the surveyed meridian being placed a few hundred meters west of this longitude. The town was named for George Lloyd (Anglican Bishop of Saskatchewan), a strong opponent of non-British immigration to Canada. During a nearly disastrous immigration journey, which was badly planned and conducted, he distinguished himself with the colonists and replaced the Barr Colony's leader and namesake Isaac Montgomery Barr during the colonists' journey to the eventual townsite. The town developed rapidly: by 1904 there was a telegraph office as well as a log church; in 1905 the Lloydminster Daily Times started publication and the first train arrived on July 28. While provincehood of some sort for the prairie territories was seen as inevitable by 1903, it had been widely expected that only one province would eventually be created instead of two. The colonists were not aware of the federal government's deep-rooted opposition to the creation of a single province and thus had no way of knowing that the Fourth Meridian was under consideration as a future provincial boundary. Had they known, it is very unlikely they would have sited the new settlement on the future border. When the provinces of Alberta and Saskatchewan were created in 1905, the Fourth Meridian was selected as the border, bisecting the town. Caught by surprise, Lloydminster residents petitioned for the new border to be revised so as to encompass the entire town within Saskatchewan, without success. For the next quarter century, Lloydminster remained two separate towns with two separate municipal administrations. Finally, in 1930 the provincial governments agreed to amalgamate the towns into a single town under shared jurisdiction. The provinces, again jointly, reincorporated Lloydminster as a city in 1958. Commemorating Lloydminster's distinctive bi-provincial status, a monument consisting of four 100-foot survey markers was erected in 1994 near the city's downtown core. 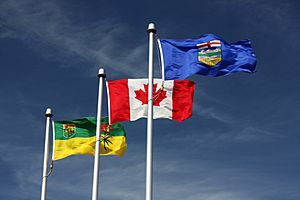 Although the majority of Lloydminster's population once lived in Saskatchewan, that ratio has long since been reversed; in the Canada 2011 Census, nearly two-thirds of the city's population lived in Alberta. In 2000, the city hall and municipal offices were re-located from Saskatchewan to Alberta. Since Lloydminster's founders were attempting to create a utopian, temperate society, alcohol was not available in Lloydminster for the first few years after its founding. The provincial border runs north to south, falling directly on 50th Avenue (Meridian Avenue) in the centre of Lloydminster. 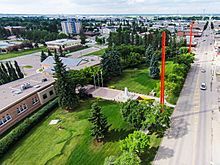 Addresses east of 50th Avenue are considered to be in Lloydminster, Saskatchewan and addresses west of 50th Avenue are considered to be in Lloydminster, Alberta. 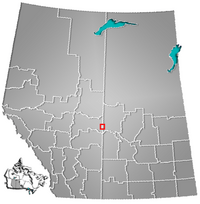 The city is bordered by the County of Vermilion River, Alberta, on the west, the Rural Municipality (R.M.) of Britannia No. 502, Saskatchewan, on the northeast and the R.M. of Wilton No. 472, Saskatchewan, on the southeast. Lloydminster's distinctive situation is reflected in other legal matters, including its time zone. Most of Saskatchewan does not observe daylight saving time, instead staying on Central Standard Time year-round. However, Alberta mandates daylight saving time. Lloydminster's charter allows the city to follow Alberta's use of daylight saving time on both sides of the provincial border in order to keep all clocks within the city in sync. This has the effect of placing Lloydminster and the surrounding area in the Mountain Time Zone along with Alberta. During the summer, the entire province is on UTC−06:00—Mountain Daylight Time in Lloydminster and Central Standard Time in the rest of the province. During the winter, Lloydminster is on Mountain Standard Time with the rest of Alberta, which is UTC−07:00. The provincial line divides the city in two aspects related to communications. Telephones on the Saskatchewan side are assigned to area codes 306 and 639, the two area codes assigned to that province, while land lines on the Alberta side have numbers in the 780 and 587 area codes, the two area codes assigned to northern Alberta. Similarly, Saskatchewan addresses have a postal code with a forward sortation area designation (first three characters) of "S9V", and addresses in Alberta have postal codes beginning with "T9V". All postal codes in Canada beginning with the letter "S" are assigned to Saskatchewan, and those beginning with "T" belong to Alberta. Lloydminster was not exempted from recent anti-smoking legislation passed by Saskatchewan's legislature. Citizens responded by initiating a referendum against the wishes of the mayor, as permitted in the charter, which resulted in the enactment of a city-wide anti-smoking bylaw. The matter was made a moot point when Alberta enacted its own anti-smoking legislation, which was the solution that the mayor and council preferred. Lloydminster experiences a humid continental climate (Köppen climate classification Dfb), which approaches a subarctic climate (Köppen Dfc) due to May and September being only marginally above 10 °C or 50 °F. Winters are long, cold and dry, while summers are short, warm and moderately wet. Year-round precipitation is fairly low, with an average of 408 millimetres or 16.06 inches, whilst the dry winters restrict snowfall to 0.98 metres or 38.6 inches. The highest temperature ever recorded in Lloydminster was 38.1 °C (100.6 °F) on 12 July 2002. The coldest temperature ever recorded was −50.0 °C (−58 °F) on 13 January 1911. In the 2016 Census of Population conducted by Statistics Canada, the Alberta portion of the City of Lloydminster recorded a population of 19,645 living in 7,444 of its 8,444 total private dwellings, a change of 8.9% from its 2011 population of 18,032. With a land area of 24.04 km2 (9.28 sq mi), it had a population density of 817.2/km2 (2,117/sq mi) in 2016. Meanwhile, the Saskatchewan portion of Lloydminster recorded a population of 11,765 living in 4,392 of its 4,909 total private dwellings, a change of 20.4% from its 2011 population of 9,772. With a land area of 18.28 km2 (7.06 sq mi), it had a population density of 643.6/km2 (1,667/sq mi) in 2016. Overall, the entire City of Lloydminster recorded a population of 31,410. With a land area of 42.32 km2 (16.34 sq mi), it had a population density of 742.2/km2 (1,922/sq mi) in 2016. The City of Lloydminster's 2015 municipal census counted a population of 31,377, a change of -0.3% from its 2013 municipal census population of 31,483. 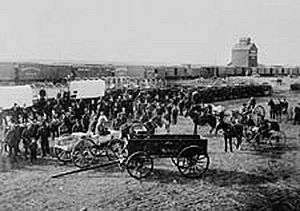 Of the 31,377 residents, 19,740 (63%) lived on the Alberta side and 11,637 (37%) lived on the Saskatchewan side. In the 2011 Census, the City of Lloydminster had a population of 27,804 living in 10,613 of its 11,453 total dwellings, a change of 15.7% from its 2006 population of 24,028. With a land area of 41.53 km2 (16.03 sq mi), it had a population density of 669.5/km2 (1,734/sq mi) in 2011. Of this total, 18,032 people (65%) lived on the Alberta side and 9,772 (35%) lived on the Saskatchewan side. There are substantial demographic differences between the populations on each side of the border, with the population on the Saskatchewan side being substantially younger; the median age on the Saskatchewan side is 26.6, nearly seven years less than the median age of 33.2 on the Alberta side. Even when combining the median ages for both sides of the city, Lloydminster has the youngest median age in all of Canada. Also, the specific age group of 20–24 is much more concentrated on the Saskatchewan side. The two sides of the city have virtually identical numbers of people in that age group (1,220 in Saskatchewan, 1,230 in Alberta) even though the total population on the Alberta side is nearly twice that of the Saskatchewan side. This situation has been attributed in part to differential car insurance rates for drivers; because Saskatchewan has a public auto insurance system while Alberta relies on conventional private insurance, young drivers with the highest insurance rates can save thousands of dollars by living in Saskatchewan rather than Alberta. The census agglomeration of Lloydminster includes both parts of the city, as well as the rural municipality of Wilton No. 472, the town of Lashburn, Saskatchewan, and the village of Marshall, Saskatchewan. About 94% of residents identified English as their first language. More than 1.4% of the population identified French as their first language, while 0.8% identified German, 0.7% identified Ukrainian, and 0.5% identified Cree as their first language learned. The next most common languages were Chinese and Spanish at about 0.3% each. More than 78 percent of residents identified as Christian at the time of the 2001 census, while over 18 percent indicated that they had no religious affiliation. For specific denominations Statistics Canada found that 31% of residents identified as Roman Catholic, and 44% Protestants of which, 18% identified with the United Church of Canada, more than 7% identified as Anglican, about 5% identified as Lutheran, almost 3% identified as Pentecostal, about 2% identified as Baptist, and just over 1% of the population identified as Eastern Orthodox. More than 8% of residents identified themselves as aboriginal at the time of the 2006 census. Lloydminster Facts for Kids. Kiddle Encyclopedia.